RS232 voltage levels is something I have touched on in the past but so far have not really addressesed in depth. 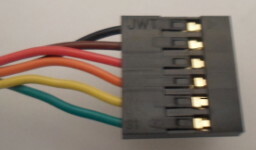 Although the USART modules in various PIC microcontrollers implement the RS232 protocol, this does not extend to the electrical characteristics expected by RS232 interfaces, and as a result they cannot be directly attached to a PC serial port without blowing the whole IC. RS232 typically uses ±13 volts to represent the high and low parts of a bit-stream, but it can be as high as ±25 volts. These voltage levels are used to avoid problems with electrical interference, as RS232 is intended for external interfaces, but these voltages are vastly above the 3-5 volts used by most integrated circuits. This article will cover the practicalities of using RS232 to communicate off-circuit. In practice the Ground, Transmit, & Receive pins are the only ones most people will be interested in. The Vcc is circa 5 volts from the USB port, but given past experience with relying on USB power, I would avoid using it for powering anything other than an individual chip. 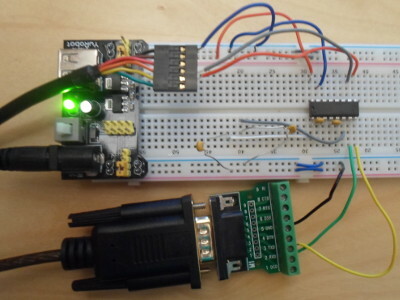 In order to attach normal RS232 interfaces to a microcontroller, an RS232 driver is required, which converts between RS232 standard and TTL voltage levels. For demonstration purposes I will use the ADM232AANZ (Farnell 1438715), which uses external capacitors in order to obtain the voltage levels required for RS232. In the circuit below it converts between a TTL-232R-3V3 TTL-USB adapter and a generic RS232-level USB adapter (Burn Technology BT232G) of which I have forgotten the supplier of.